Sorry to disappoint you, recent Apple Watch buyers, but you’re not going to be able to use one of those brand new Apple Watch strap trading sites to get a whole new, extra watchband when your Apple Watch arrives. In case you missed it, a couple of Apple Watch band trading sites recently popped up, reportedly offering owners the ability to swap out the included extra watchband with someone else’s for a small fee. Unfortunately, you don’t actually get two full watchbands with your purchase, despite what Apple’s website seems to claim. The larger of the two sites, BandSwapper, has been getting some recent blog coverage for what initially sounds like a brilliant idea. The site says it aims to help Apple Watch Sport owners switch out their unused strap by exchanging it for one of a different size and/or color. BandSwapper would collect a $6 fee then send back the new Sport Band the customer requested. The idea for band-swapping came about because you it would allow you to order combinations of watch and straps that wouldn’t otherwise have been available. (Some straps are only sold with certain watches, that is.) But it became even more attractive an option when it appeared that Apple Sport Watch models actually shipped with two bands: one for smaller wrists and one for larger wrists. 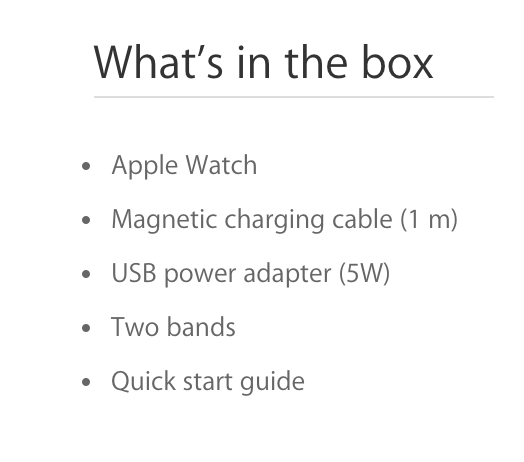 The confusion came in because Apple’s website reads “two bands” when listing what its Sport Watch package included. After receiving your Watch, you would, in theory, only end up using one of the bands – whichever was the correct size for your wrist. The other you could swap! Another website, StrapSwap, is offering a similar swapping service. But there, buyers and sellers connect directly and mail each other unused straps or agree to meet up locally. The idea, frankly, seemed genius. Sadly, it’s not going to work exactly like that. You see, Apple Sport Watch models technically do come with two bands, but in practice, it’s not two full bands, but rather three pieces. There’s one piece that attaches to one end of the watch with the fastener, and then two additional bands (the side with the holes) that attach to the other side of the watch. These two bands come in two different lengths – a S/M size for smaller wrists and an M/L size for larger wrists. In other words, you won’t have an entire extra band to swap. Now, I guess you could start a new fashion trend and swap your extra half band for a half band of a different color. (I bet this look would have really taken off back in the 80’s!). But that’s not what people thought they were signing up for, in many cases. You could also swap out your current band (the two pieces) in case you have buyer’s remorse over your original selection, or just get bored with the band after some time. Or, as noted above, you could swap for a band that you wouldn’t have otherwise been able to order because it only comes with a particular watch model.
.@earthTOmitchel thanks for the article. Your update mentions “readers have pointed out..” Please note that speculation is not confirmation. However, we have definitively confirmed – with very good authority – that the Sport Watch comes with 3 pieces, and not 2 full bands. Plus, you can look at the picture here and see it for yourself. I know, I know. I’m sad too.